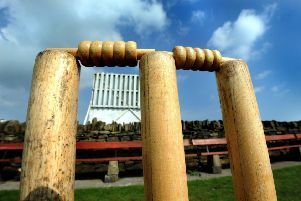 Percy Main seconds recorded a 95-run win over Lanchester seconds at St John’s Terrace on Saturday. Home captain Steven Patterson took advantage of the visitors only having ten men by electing to bat when he won the toss. They recovered from losing Jonathan Prested for 11 with the score at 34, as James Stanistreet and Ben Jenkins added 56 for the second wicket. Stanistreet was positive in his strokes as he played shots on both sides of the wicket, and he brought up a consecutive half century before he was out for an entertaining 60. Lanchester’s hopes were briefly raised when Andy Beer was out for a quick 14 to leave Main 105-3. However, Jenkins and Alex Young added 145 in 30 overs for the fourth wicket. Both brought up maiden second team half centuries as they looked to pile up the runs. The partnership ended when Young was out for 60. Jenkins batted through the innings, finishing 75 not out as Percy Main rattled up 264-4 from their 45 overs, setting a new second team record in the process. Blyth Duncan Jr struck twice inside the opening 13 overs as Lanchester was reduced to 30-2. He finished with 2-18 from his ten overs. Zak Spence (1-38 from ten) supported Duncan Jr by bowling tightly and took a wicket himself as Lanchester were 55-3 after 20 overs. With Lanchester needing 210 from the remaining 25 overs, Patterson brought himself on and bowled his allotted ten overs straight through, taking 3-31. He was ably assisted by Stanistreet (1-29) and David Hancock (0-14) as Lanchester finished on 169-7 from their 45 overs. This gave Percy Main victory by 95 runs. This result sets up Patterson’s men for their trip to Alnmouth next Saturday. Meanwhile in the third team game at Consett on Sunday, Percy Main captain Craig Hall was left to rue what might have been. Hall won the toss and elected to bowl on a damp surface. The decision was vindicated as Blyth Duncan Jr, David Hancock and Ali Maberly all took wickets inside the first 20 overs as Consett was reduced to 58-6. However, some stubborn batting from the lower order and some dropped catches allowed Consett to reach 186-9 from there allotted 45 overs. Percy Main’s reply started well as Duncan Jr and Bryan Cowey put on 50 for the third wicket before Cowey was out for 30. Duncan Jr would go on to pass 50 as Percy Main reached 100-3 in the 22nd over. But a steady fall of wickets reduced them to 135-6. Duncan Jr fell for a well constructed 68. Captain Craig Hall, batting at number eight, played some lovely drives, scoring 29 to take the score to 180-8 before he was out lbw to a slower ball. Last man Hancock came in needing seven runs for victory with five overs remaining. He played his first ball through the slip cordon but was run out by a good throw when attempting the second run. His dismissal meant Percy Main were all out for 181 which gave Consett victory by five runs.